Not one but two Progressive Jackpots make up the ultimate prize with Wok and Roll; a 5 reel 25 payline video slot featuring a Wild symbol, Scatter wins, multipliers and two Free Spins feature all brought to you by Real Time Gaming. This video slot can be played through any of our RTG Casinos listed above in the where to play section. A Chinese food-themed video slot, Wok and Roll symbols consist of the Chef (Wild symbol), Logo, Chinese Girl, Fortune Cookie, Noodles, Fish, Restaurant, Dumplings, Shrimp Fried Rice, Bok Choy, Egg Rolls, Knife and Wanton Soup. Betting options on the this video slot range from $0.01 to $0.10, $.0.25, $0.50, $1.00, $2.50 and $5.00 per line. Wok and Roll will give you the option to choose from 1-25 paylines where the least you can bet is a penny per spin up to a maximum of $125.00 per spin; perfectly providing a betting range for the casual player to the high rollers. Press the “Stop” button in mid-spin to manually stop the reels and when ready for play, press the “Spin” button after selecting your bet. 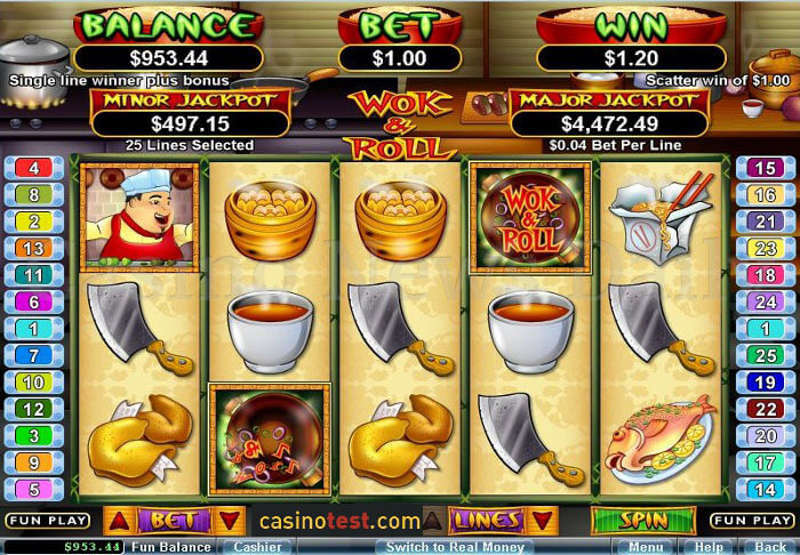 Wok and Roll video slot’s top paying symbol is the Chef where a 5,000 coin top jackpot can be won if you land 5 Chefs symbols on a selected payline. The Wild symbol is the Chef and will substitute for all other symbols except for the Wok and Roll Logo symbol. Other than the 5,00 top jackpot, landing the Chinese Girl will award you with 2,500 coins; 1,250 coins with the Restaurant and 1,000 coins with the noodles symbols. Receive a payout of 1x, 3x, 20x or 200x of your total bet when 2, 3, 4 or 5 of your Wok and Roll Logo Scatter symbols is landed. Win 8 Free Spins when anywhere on the reels 3 or more Scatter symbols appear. 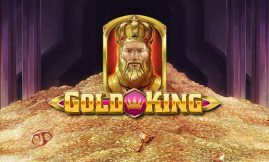 Each of the 8 Free Spins have a multiplier of 2x, 3x, 4x, 5x or 10x multiplier. 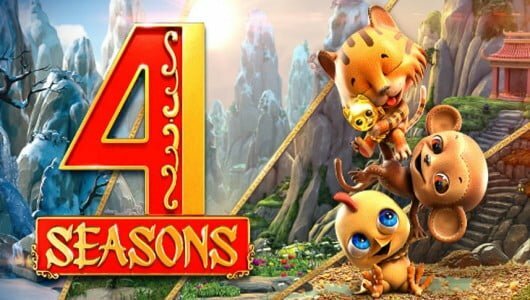 This special feature doesn’t stop there, however, has you can win 8 more Free Spins when 3 of more Scattered or Wok and Roll symbols appear on the reels during the already Free Spins feature. Trigger this feature and Wok and Roll your way to big wins! All Free Spins are played at the lines and bet of the triggering game. Win 10 Free Spins when 3 or more Scattered Chefs appear on the reels and during the Chef Free Spins feature, an extra Wild substitute may appear. A 2x multiplier will take effect in the Free Spins feature whenever an Extra Wild symbol substitutes in a winning combination. Note that during the Free Spins feature, the Wok and Roll symbol will not appear. However, during this feature, 5 more Free Spins can be won if 3 or more Scattered Chefs and/or Extra Wild symbols appear. As before, Free Spins are played at the lines and bet of the triggering game. The game rules of Wok and Roll video slots are as follow; except for the scatter symbol (which pays any), all symbols pay left to right. Wins on different paylines are added as are Scatter wins, which are added to paylines. Total bets are multiplied by your Scatter wins, while per line bets are multiplied by your payline wins. Highest win only on each payline. 50,000x bet per line is your maximum win per paid spin. 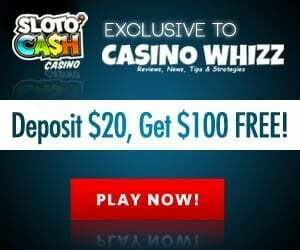 Talked about at the beginning of this article, Wok and Roll has not one but two Progressive Jackpots; a Minor and Major jackpot just waiting to be won and because these Progressive Jackpots are random, they can bring you new-found riches on any spin. Better yet is all Progressive Jackpot wins will be added to other wins all making for a handsome payday. 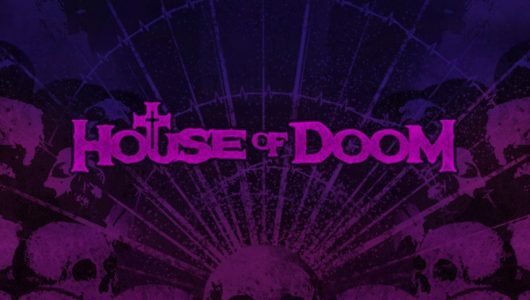 Return to Player percentage is 1.5% of the total jackpot contribution. Explore the autoplay settings on Wok and Roll by hitting the “Autoplay” button which will open the advanced autoplay mode. The settings in autoplay mode consist of being able to set the number of spins; when a jackpot is won, set it to stop; if a win exceeds or equals (any amount you input), you can also set it to stop. Stop the game on any win or if your balance increases/decreases by any amount you input and lastly, once the feature is triggered, it can also be stopped. To end autoplay mode, press the “Stop Auto” button to deactivate this feature. Though, this game is a bit different as far as themes go, who doesn’t love Chinese food? 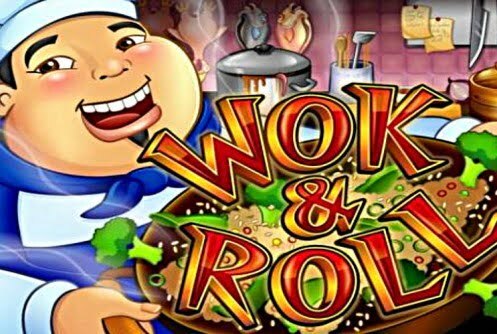 And that is where Wok and Roll shines when bringing to life this video slot with a great presentation encompassed with nice comic-style art, animations and sound effects. 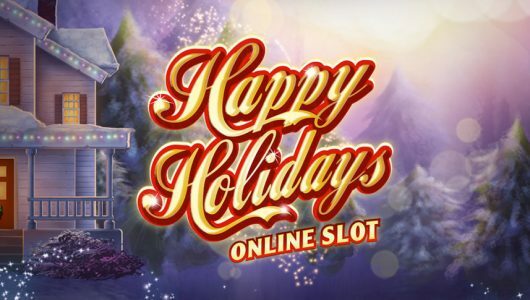 And while the payouts are are fairly good with this video slot, it is the two excellent Free Spins features and Progressive Jackpots that really set this game apart.